There is a lively, but largely artificial, debate over the differences between swim ponds and natural swimming pools. There need be no debate if we can simply understand and agree on the terminology of these watershapes. When we design a body of water for the purpose of swimming activities and/or recreational bathing, whether you call it a swimming pond or a natural swimming pool, it should be designed, permitted, and constructed to current and accepted swimming pool standards. If the purpose of the vessel does not include swimming, but it’s large enough to swim in, then it’s a pond and such standards should not be applicable. A look at history helps us understand how the confusion of terminology developed between pond, swimming pond, and natural swimming pool. Natural swimming pools, as originally developed in German-speaking Europe, were first called either schwimmteiche(swimming ponds) or badeteiche (bathing ponds). These watershapes have three fundamental attributes. First, they are contained vessels, watertight and isolated from ground water and surface runoff. Second, there is no disinfection, e.g., no use of chemicals, no UV, no ions, no devices—nothing but natural biological ecosystems to clarify and purify the water. Third, the area designated for swimming is physically separated from the planted water garden so the swimmers don’t touch or trample the plants. Recommendations for private residential natural swimming pools were published in 2003 by the German FLL (Forschungsgesellschaft Landschaftsentwicklung Landschaftsbau) or Research Institute for Landscape Development and Landscape Construction. This organization’s work identifies and defines five discrete types of schwimmteiche, which can be divided into single vessel (one-pot) designs and multiple vessel (two or more pot) designs. The one-pot schwimmteiche tend to be pond-like in appearance, and the two-pot schwimmteiche usually look more like a traditional swimming pool with a separated water garden. The first major work in English was published in 2005 by Michael Littlewood and translated “schwimmteiche” into “natural swimming pool” rather than the more direct “swimming ponds.” While I have long maintained that we’re really building “constructed swimming ponds,” I must agree that “natural swimming pool” sounds a lot better. 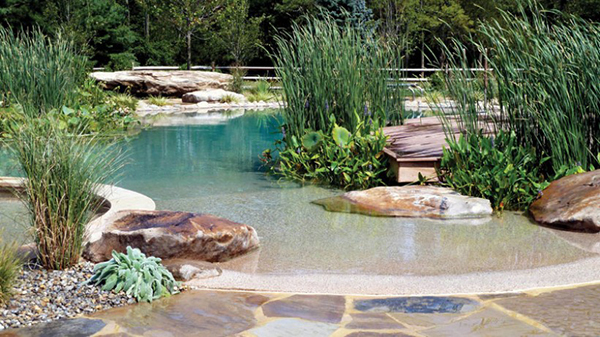 Our firm, BioNova Natural Pools, began introducing natural swimming pools to North America in 2008. Our products are built with strong conformance to the German FLL Guidelines, and we have consciously chosen to use the term natural swimming pool, abbreviated to NSP, to indicate conformance with swimming pool design and building standards. This conformance, as well as the three fundamental attributes, is met for all BioNova NSPs whether they have the appearance of natural ponds or the appearance of formal, traditional swimming pools. Nomenclature issues exist also in German-speaking Europe. Often, schwimmteiche is used to describe a design, usually one-pot, that mimics a natural pond in appearance. A relatively new term, “naturpool” (which I believe has been reverse cycled from the English use of the term “natural swimming pool”), tends to describe a two-pot construct of more traditional swimming pool design elements. Prevailing for any design, however, are the human safety and water quality standards applied to these swimming ponds or natural swimming pools. Call it what you will, but if it is designed for use as a vessel for swimming, then it should be in conformance with applicable codes and permit requirements for the installation of a swimming pool. Whether designed to look like a swimming pond or like a natural swimming pool—it’s for swimming. A pond built as a water feature, that is, a pond not intended for people’s swimming, should not be subjected to rigorous code requirements on design and construction. It is very important that such watershapes should not be called swim ponds. And it is also important to note that contractors should not tell their customers it is permissible to swim in their pond because the water is natural and pure. When the watershape is marketed for swimming, it must be built to the safety standards for fencing, slopes, floors, depth configuration, diving, entry/exit, electrical, plumbing, VGB compliance, etc. To do less than full compliance with best current practices for swimming pool design and construction would be disingenuous and would probably put the contractor and the homeowner seriously at risk in the event of a mishap. Caution in terminology also applies to designers of natural swimming pools. These products shouldn’t be called “swimming pools” because the definition of this term includes a means of disinfection. It is prudent to use the terms swim pond and/or natural swimming pool to distinguish these from swimming pools; this difference from disinfected swimming pools holds even though swim ponds and/or natural swimming pools may have different design (appearance) implications. Some NSPs can look exactly like a swimming pool — and some NSPs can look exactly like a pond. The terminology of our constructed watershapes should reflect function and form. If it is meant for people to swim, it should be designed and constructed in conformance with all health and safety requirements. Disinfected, it’s a swimming pool. Cleansed with natural, biological ecosystem technology, it’s a swim pond or a natural swimming pool, perhaps distinguished by the naturalistic or formal design. Not meant for people to swim? Then it’s a pond to be marketed, designed, built, and enjoyed as a non-swimmable water shape. There’s no need for a swim pond versus natural swimming pool debate, if we agree on terminology. James Robyn is the President and CEO of both Rin Robyn Pools, a pool design/build firm based out of New Jersey, and BioNova Natural Pools, a pioneer in bringing the European Natural Swimming Pool technology to North America. Robyn is a second-generation pool builder with more than 37 years of experience.